The Flatiron Building is located at 175 Fifth Avenue in New York City and was completed in 1902. This building was designed by Daniel Burnham John Wellborn Root and stands 285 feet tall with 22 floors. This famous skyscraper was originally known as the Fuller Building. This pewter replica stands 4-1/4 inches tall and is finished in antique pewter. This model's scale is 1 inch = 75 feet. This is an incredible replica of the Flatiron building. I'm most pleased with the 75 scale replica with such great detail! 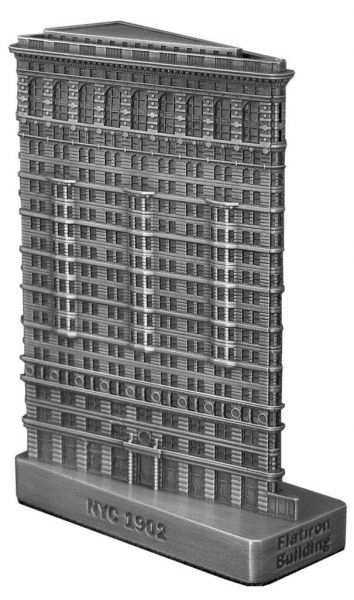 Great replica of a classic new york city skyscraper. Nicely done.